Be generous with the spices for this dish, and it will soon become your family’s favorite. Serves easily 2-4. 1) one small Cornish hen–the smallest you can find. Marinate the Cornish hen with 1 tsp of cumin, coriander, 1/2 tsp of ground cinnamon, cayenne (or paprika), lemon juice, 1 tsp of balsamic vinegar, 1 tbslp of olive oil, salt, pepper, and 1/4 tsp of turmeric and leave overnight. In a pot under medium heat add the rest of the olive oil, onions, salt and cumin. Sautee until browned. Add the rice, and fry a little–about 1 minute. Add the dried lemon, green chilly pepper, cumin, coriander, cinnamon, and pepper, and add 1 cup of water. Cover and let cook under low heat. Once the water has dried (the rice will not be cooked through yet), turn off the heat and carefully spoon the rice into the cavity of the Cornish hen, stuff it as much as you can. Close the opening with some toothpicks–use non-colored toothpicks. As for the remainder of the rice, keep aside for the next step. Now take a piece of non-stick foil big enough to wrap the chicken. 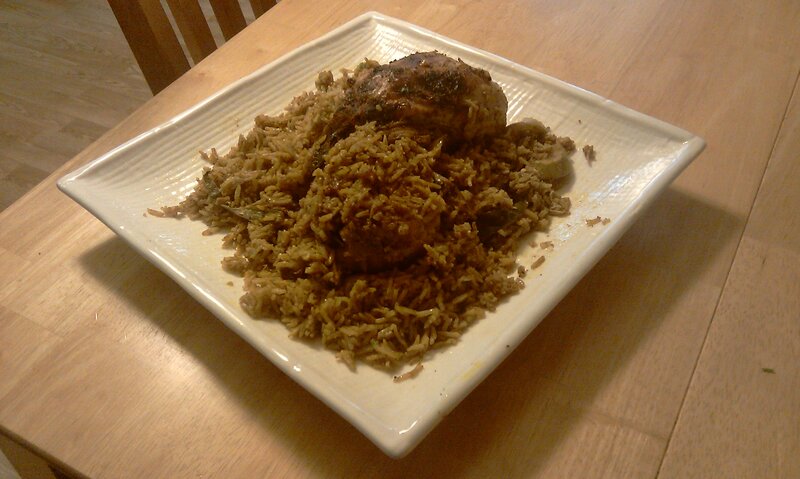 On the foil spoon some of the rice and place the chicken on top, then spoon the rest of the rice on the sides of the chicken. Wrap the foil around the chicken very well, leave no opening whatsoever. Place as is, under a broiler (at hight) for an hour to an hour and a half. After that time, take out of the oven, open up the top and return to broiler to brown on top. Serve immediately with a green salad and yoghurt.